Apple's march toward transparency continued on Friday with the launch of the Swift Blog, a new developer-focused blog covering the Swift programming language introduced by the company at WWDC. In a brief introductory post, Apple said the blog will give developers "a behind-the-scenes look into the design of the Swift language by the engineers who created it, in addition to the latest news and hints to turn you into a productive Swift programmer." As it does with most of its oft-updated content, Apple offers an RSS feed for developers and other interested parties to follow along. The company then took to the new platform to give an update on Swift compatibility. Swift applications will be compatible with the company's current-generation operating systems —namely OS X Mavericks and iOS 7 —as well as future releases, but there does not appear to be any plan to make Swift available on earlier versions. Because Swift is so new, Apple said applications built on the new language will by default include a copy of the Swift runtime to ensure compatibility. This means developers will need to be careful to build every facet of their application with the same version of Xcode and the Swift compiler for at least "a year or two" while the language stabilizes, and they are cautioned to avoid dependence on pre-built frameworks until then. 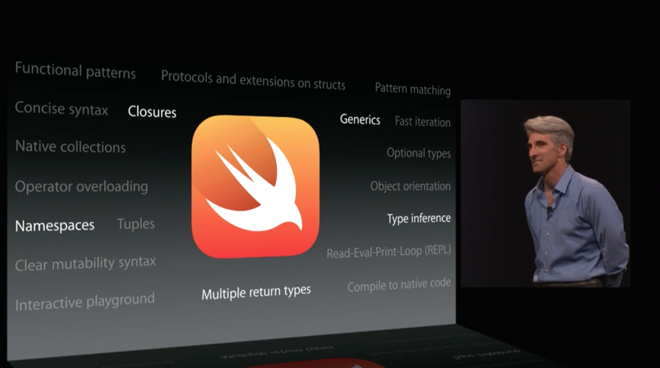 Apple unveiled Swift, a long-term replacement for Objective C, at its annual developers conference last month. The language was created over a period of three years by a small team within Apple, led by LLVM inventor Chris Lattner, though it is unclear if Apple plans for Swift to follow LLVM's open-source path.